The group discussed shared challenges in the stately Meridian House Dining Room. 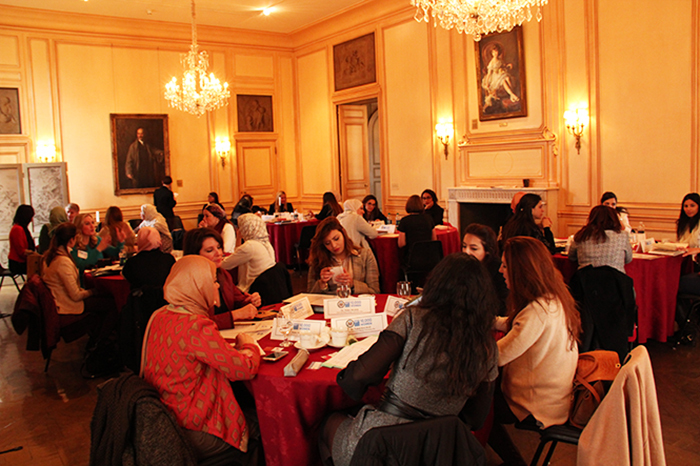 On March 4, 2016, Meridian International Center welcomed a group of women entrepreneurs and leaders from the Middle East and Northern Africa (MENA) for a morning of speed convening with some of Washington, DC’s leading women entrepreneurs. 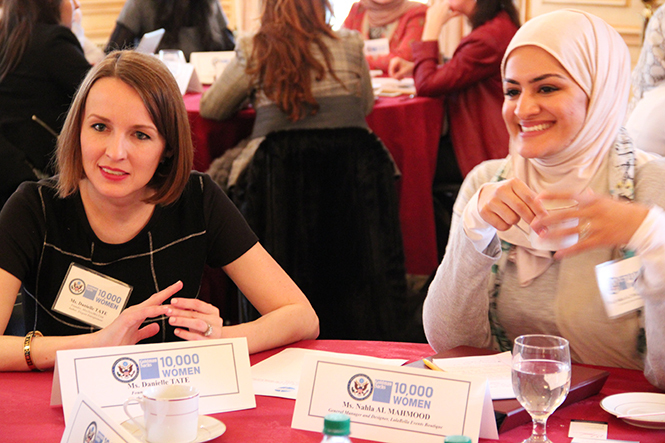 The delegation was a part of the Goldman Sachs 10,000 Women – U.S. Department of State Entrepreneurship Program for Women in the Middle East and Northern Africa. Launched in 2015, the program is a public-private partnership working to advance entrepreneurship in the Middle East and Northern Africa. The program offers mentoring opportunities with Goldman Sachs employees in New York City; Washington, D.C.-based visits with local business incubators, along with discussions with leading policy makers; and a four-day training program at Harvard Kennedy School. 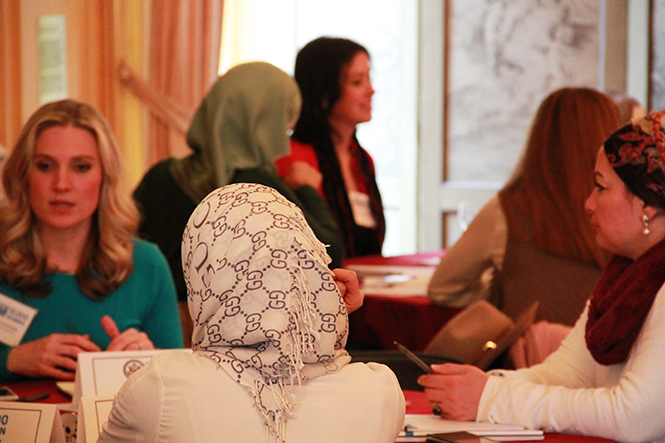 Over the last two years, the program has provided advanced leadership and entrepreneurship training to 56 exceptional women leaders from 16 countries throughout the region. The Goldman Sachs 10,000 Women initiative is an effort to foster economic growth by providing women entrepreneurs around the world with a business and management education and access to capital. The initiative has reached women from across 56 countries through a network of 100 academic, nonprofit, and bank partners. In partnership with International Finance Corporation (IFC), 10,000 Women launched the first ever global loan facility dedicated to women in 2014 to enable up to 100,000 women entrepreneurs to access capital. The program at Meridian International Center featured five 15-minute speed-mentoring sessions between the visiting delegation and some of Washington, DC’s top women entrepreneurs, such as Marsha Ralls, President and CEO of Closed Monday Productions, LLC; Kathy Korman Frey, Founder of the Hot Mommas Project and Director of Women’s Entrepreneurial Leadership at The George Washington University; and Danielle Tate, Founder of MissNowMrs.com. Discussion topics varied from the importance of hiring “best” employees and how to maintain an equal work/life balance to the value risk taking and how to learn from failure. The women were also eager to address the use of technology to take their businesses to the next level and to learn modern marketing strategies. Marsha Ralls and an Egyptian entrepreneur share tips on how to scale a business. 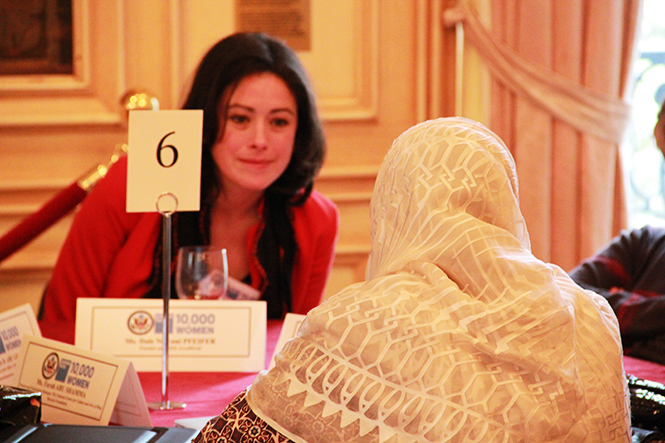 Danielle Tate and Nahla Al Mahmood from Bahrain listen to a fellow participant’s work/life balance story. Shana Glenzer, Chief Marketing Officer at MakeOffices, discloses promotional marketing strategies. 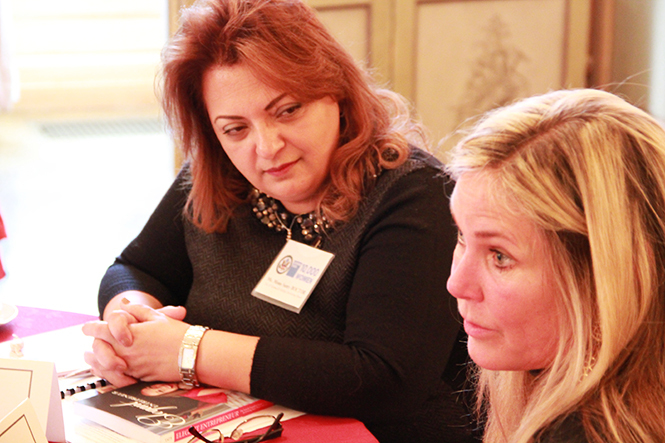 Dale Nirvani Pfeifer, Founder and CEO of GoodWorld, listens to a participant’s technology strategies.